Stuart C. Aitken is Professor of Geography at San Diego State University. His books include Philosophies, People, Places and Practices (with Gill Valentine, Sage 2006), Geographies of Young People: The Morally Contested Spaces of Identity (Routledge 2001), Family Fantasies and Community Space (Rutgers University Press, 1998), Place, Space, Situation and Spectacle: A Geography of Film (with Leo Zonn, Rowman and Littlefield, 1994) and Putting Children in Their Place (1994, Washington DC: Association of American Geographers). He has also published widely in academic journals including the Annals of the AAG, Geographical Review, Antipode, The Professional Geographer, Transactions of the IBG, CaGIS, Society and Space, The Journal of Geography and Environment and Planning as well as various edited book collections. His interests include film and media, critical social theory, qualitative methods, public participation GIS, children, families and communities. Stuart is past co-editor of The Professional Geographer and current North American editor of Children's Geographies. 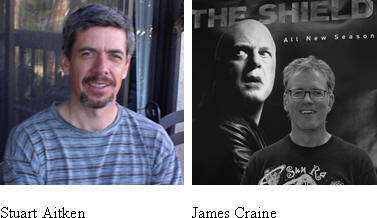 Jim Craine is an Assistant Professor of Geography at California State University, Northridge. He has published in various academic journals and has authored or co-authored chapters for a number of edited book collections. His interests include geographies of media, particularly cinematic geographies; geovisualization; and cultural production.